Al was injured by an IRA bomb whilst serving as a 21 year old Paratrooper in Northern Ireland in 1992. He suffered catastrophic injuries including losing his left leg below the knee and his right was amputated just under his hip. He spent the following 7 years in hospital. Al says he was “stitched up and had the bits he had left pieced back together”. In 1998 whilst kayaking in the Lake District on an outdoor pursuits weekend, a member of the Red Devils Parachute Display Team, Paul Burns, suggested that Al do a tandem skydive near Nottingham at Skydive Langar. ‘It was the coolest thing I’ve ever done, so thought, wow, I gotta do that again’. A year later, after embarking on an accelerated freefall programme, he became Britain’s first double amputee skydiver and the worlds first double amputee to learn to skydive post injury. 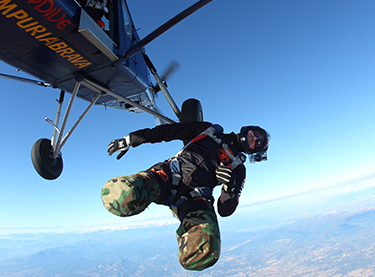 Al later went on to skydive with the Army’s freefall display team, the Red Devils. In 2006 he married fellow skydiver, Pixie, in a hot-air balloon in Arizona, leaping out of the basket with her at 5,500ft. Then he began competing at National level in 2007 where he succeeded in winning six gold medals concurrently from 2007-2012, his discipline was Freestyle skydiving where he competed in a team with his wife. Al wanted to compete at international level but due to the high expense of training at world level and lack of funding meant it was simply not possible. The Soldiers’ Charity heard about Al’s mission and provided the financial backing in 2010 to assist with the training costs over the next three years to ensure Al and his wife had a fighting chance. This enabled Al and his wife Pixie to train at the highest level and secure a silver medal in 2010 and two bronze medals in 2011 and 2012 at the Skydiving World championships held in Russia, Germany and Dubai. Al continues with his passion for skydiving, touring the world’s dropzones offering help and advice to other injured skydivers and of course jumps as much as humanly possible. Al told us that ‘Without the help of the Charity we wouldn’t have got to where we have over the last few years; the support that I got from the Army and The Soldiers’ Charity has been incredible. I hope that I can prove that someone like me, as severely injured as I am, can compete with able bodied people in a dynamic sport and win, maybe become the best in the world at it’. Al is encouraging our adventurous supporters to sign up for one of our charity jump days and undertake a sponsored skydive with the Army’s Parachute Display Team. Why? Because according to Al ‘When you jump out of a plane, it’s not an exit it’s an entrance. It’s an entrance into a completely different world. There’s a saying in skydiving: If you don’t skydive there is no explanation. If you are a skydiver, no explanation is needed’. If you want to experience the thrill of a skydive, why not sign up to one of our tandem skydives with the Red Devils? Without your support we wouldn't be able to provide the life changing support we give to former soldiers like Al. Help us continue to be there for soldiers, veterans and their families by making a donation today.